We are very saddened to report that we lost Cookie today. He was deeply loved by Diane, his foster caregiver, and leaves a hole in our hearts. He rebounded several times, but this time his little body gave out. Goodbye Cookie boy. 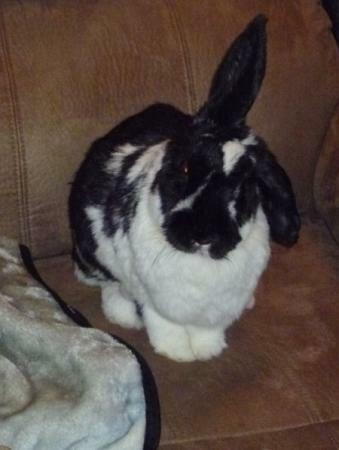 Cookie is a special needs sanctuary rabbit who has been with SaveABunny for many years. Recently, he had some major health issues and we are greatly concerned. He is currently under the medical supervision of Dr. Carolynn Harvey and getting excellent supportive care at a foster home. He recently required an ultrasound, which costs several hundred dollars. More testing and x-rays are also needed. Donations of any size to help Cookie are urgently needed and greatly appreciated! Cookie is a very sweet bunny! His litter box habits are the best even being sick. I have not been able to understand how he has gone over looked for so long and never adopted. vet bills. It means a great deal to him he can feel the love. He sends everyone big bunny hugs and kisses. Cookie is trying hard to get well. He had one day about a week ago that was the best day yet. He ate more then he had in a very long time and pooped more also. It only lasted one day but it it let me know it could happen. Dr Harvey is keeping up with him and has me call every 2-3 days. This is not something she has seen very much and is not sure what to make of it yet. Cookie has the run of the living room. He seems to like it when the TV is on. I have stairs that go up to the big chair and he loves to sit up there during the night. He does a lot during the night because toys are moved and more greens get eaten then! He is getting 50-60cc's of critical care 3 times a day with a med and some sub Q fluids. I worked up to that amount slowly. If anyone would like to email me feel free, I would love to hear from you.